In the southwestern part of the Peloponnese you’ll discover Messinia, with its bustling capital of Kalamata (famous for its olives and with an airport receiving international flights, thus giving immediate access to the region). Only two hours’ drive away from Athens, Messinia is known for its lush landscapes, endless olive groves, gorges, and beaches. It is also the home of some of Greece’s most impressive landmarks, such as the Venetian castles of Methoni and Koroni and the beautiful villages where they stand, Nestor’s Palace and Pylos. Visit ancient Messini near the village of Mavromati, to admire the beautiful ruins of the Asclepion, an amphitheatre with a mosaic floor, the stadiums and the agora. When visiting the original home of the Spartans and Dorians, begin at the top, at the tranquil, naturally abundant and scenic villages of Mt Taygetos, which during spring usually is still snow-peaked. Taygetos is an ideal place for adventure lovers as it has beautiful hiking trails, the best o which is at the Viros Gorge. Admire the (fortified) tower houses, such as the Goudelis tower in Kariovouni, and spanning views and the sound of running waters that tumble from the mountains into streams. 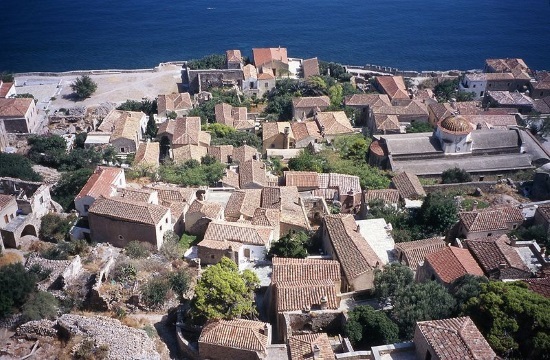 Lush yet rugged, Mani has many faces from one part to another, including quaint Byzantine churches and olive groves. Visit the picturesque coastal towns of Stoupa and Kardamyli, made famous by the British travel writer Patrick Leigh Fermor, whose home can be visited upon appointment in the Outer Mani. In the Deep Mani don’t miss the other-worldly Diros caves, head to the southernmost tip to the richly historic Cape Tenaro (across Libya), or trek up to the pretty tower houses in Vathia. When in the Peloponnese it’s nearly a sin to overlook the chance of going westwards to visit the Sanctuary of Zeus – the sacred archaeological space where the world’s first Olympic Games took place. Apart from the lovely Archaeological Museum as well as a Museum of the History of the Olympic Games, the site itself, a lush valley once filled with olive trees and called Altis that was created in the 8th Century BC, is awe-inspiring. Temples, such as those of Hera and of Zeus, the circular Philippeion dedicated to the Macedonian King Philip II, the training palestras, stadiums, and the Bouleuterion are all a feast for the eyes and imagination. The town of Olympia, in the region of Katakolo, Ilia, is unremarkable but cute for a touristy stroll with some pretty views. In the central area of the Peloponnese lies mountainous Arcadia, in Greek mythology known as the land where the go Pan lived, and the idyllic mise en scene for Rennaisance paintings and Utopic 19th Century European poetry. It was also the headquarters for General Theodoros Kolokotronis during the Greek War of Independence. Traipse through (and sample delicious traditional cuisine) at the various villages, such as Vitina, Langadia, Karytaina and Stemnitsa, the latter especially ideal for hiking or rafting along Lousios river and gorge or through the thick forests and fruit trees around Mount Mainalo. Horseshoe-shaped Dimitsana too is well worth a visit for its rich history and intriguing places such as the Ecclesiastical Museum, Gunpowder Museum, and the Open-Air Water Power Museum. Regarded as one of the most romantic places to visit in Greece, this castle town created during the Byzantine era but consequently inhabited by the Franks, Venetians, and Ottomans, is stunningly fairytale-like. It boasts the status as the only castle in Europe that has consistently been lived in, and visitors come from across the country and the world to traipse dreamily along its narrow cobblestone alleyways, stop at the lovely little stores, cafe-bars and eateries, stay in beautiful fire-lit rooms and take in airy, dramatic views of the Myrtoan Sea. There are around 40 churches there but most impressive of all are the 10th Century Aghios Pavlos, the 13th Century Aghia Sophia and Christos Elkomenos (southern Greece’s largest Medieval church). Take selfies by the cannon or walk along the fortified path to the Upper Town, to admire the perfectly maintained architecture and sea views from above.